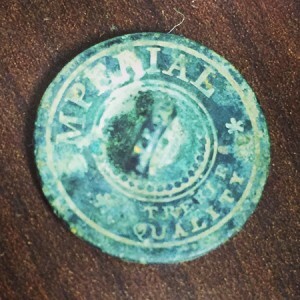 One year ago, I wrote an article entitled, “NJ Copper Coins.” In it, I told a brief history of our state’s own colonial coinage and my desire to find one of these Garden State gems (of course, pre-dating the term “Garden State.”) One year later, I’m happy to say I found it! Before I dig in, I’d like to do another sequel of sorts, adding on to “Old Buttons Found in New Jersey.” Recently, I had a great outing on a property in Central New Jersey. Over the span of just three hours, I found numerous buttons, dating from the late 1700s through the mid-1800s. In the photo below, some of the older ones are known as tombac buttons. Worn in the late 1700s and early 1800s, these copper alloy buttons often are found in the condition like mine – beat up and missing the shank/loop. And when found in farm fields, they are often victim to farm machinery and harmful pesticides. Most of the other buttons are mid-1800s and were typical fashion. Plain fronts, with various backmarks indicating the button’s maker and sometimes country of origin. Being one of the original colonies, most old buttons in New Jersey were made in England. Imagine how heavy your clothes would be if you had 10 of these on your shirt or coat! In addition to the “foreign” coins, I found something native to the colonies. 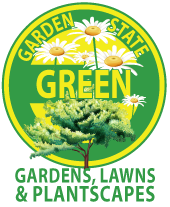 And not just native to the colonies, but native to our great state of New Jersey! 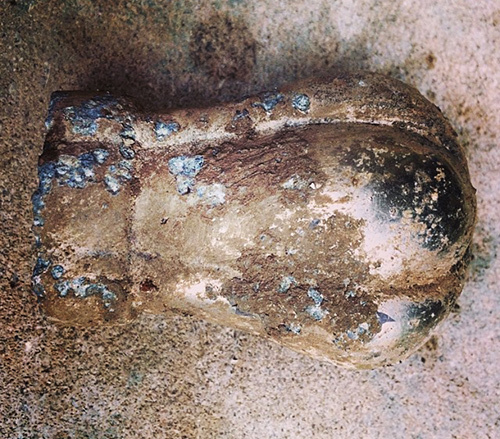 About 8-inches beneath the surface, nestled there for over 200 years, I retrieved what was obviously a coin. Caked in dirt and damaged from the elements, I wasn’t sure if I’d ever know its true identity. I carefully brushed away some dirt to see if I could reveal any detail. 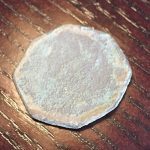 It’s wise not to add water to copper coins as they can oxidize quickly and turn green. So I just used my fingers, thinking I wouldn’t have much luck. Then, slowly, the tell-tale shield of the NJ Copper coin revealed itself! I literally felt chills and a surge of excitement when I realized that I had done it – I found the coin I had been seeking for years! While worth very little due to its condition and relative commonality of my particular coin (there were over 150 different varieties of the NJ Copper coin! ), it now ranks among my most valued treasures. 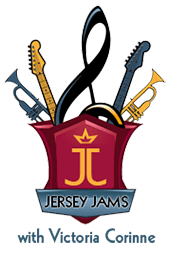 True New Jersey history! 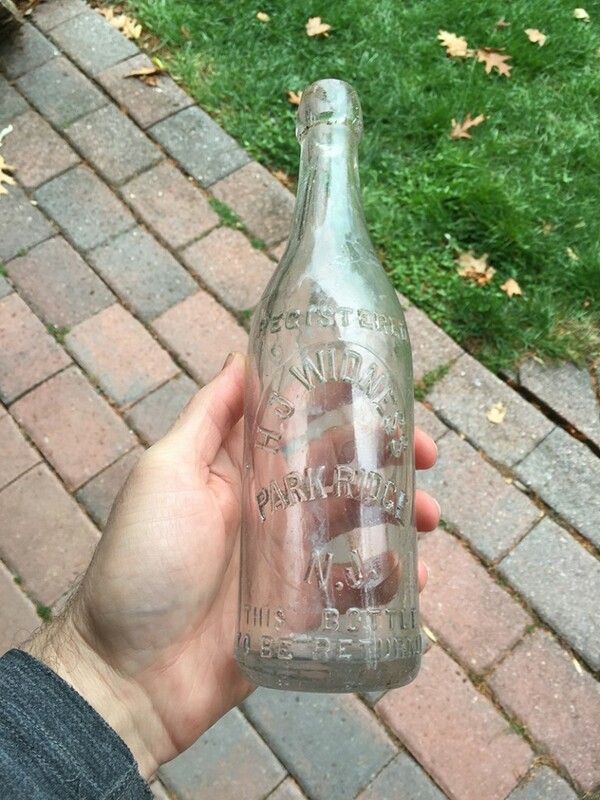 If you’ve read my previous articles here on eNJoy NJ, you’ll know I love finding old coins. For whatever reason, when it comes to finding old things, coins speak to me most. As a kid I used to love finding modern coins under the town pool’s picnic tables, as if I were discovering lost treasure. Years later I’m doing exactly that. During Colonial times, half the currency (coinage) in circulation was counterfeit. While the risks of getting caught were severe, the rewards of not getting caught resulted in more money in your pouch. Since holograms and slick invisible pens didn’t exist to help merchants determine the authenticity of the currency they exchanged, they turned to a very simple means of measurement: weight. Simply, merchants would weigh coins on a counter-balanced scale against a weight to determine if the sum paid measured up. 2 oz trade weight. Cleaning revealed “2 oz” impression. On a recent, albeit short excursion, I returned to a property that was once home to both a shoemaker and a produce stand in the early 1800s. I have previously found relics from both the 1700s and 1800s, as well as some modern goodies there. On my last outing I found something that I couldn’t identify at first. But after some help through friends on some Facebook forums, I had a lead — a possible trade weight! After some careful cleaning with a toothpick and water, I revealed the evidence I needed: “2 oz” imprinted on the face. I was very excited for a couple reasons: a) this supports the evidence of early maps that commerce did take place on this property, and b) it’s not a relic I often see found by others. Finding this trade weight has really brought me closer to the property, and to those who supported themselves through the products and services they sold. It’s the type of tangible connection that I absolutely love. 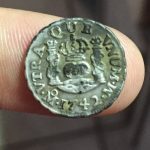 It will display nicely with the coins I found in the same area, such as a 1791 Spanish half reale and an late-1700s/early 1800s half cent, among others. I will continue to go back and find any other coins that may have fallen off the scale! 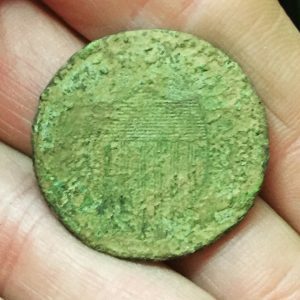 Grant Hansen is an avid relic hunter, and focuses most of his efforts in his home state of New Jersey. 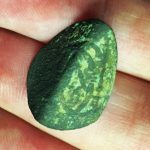 He and his detecting partner James run http://relic-hunters.com and work with local and national historical societies and museums to preserve lost history. Some of the best finds Grant has made is the people he’s met and befriended along the way. It’s the kindness and generosity of property owners that makes it possible for him to pursue his passion. These articles are dedicated to these special people. Thanks to technology, innovation and “space aged” materials, we mostly live the comfortable live. When it comes to clothing, we don’t often thing about how convenient it is to have a zipper, light-weight plastic buttons or even pockets! These things are expected. However, turn back the clock to the 18th and 19th centuries, clothing was fastened together with metal in the form of buttons, buckles and clips. Buttons from yesteryear, like today, came in all different sizes, from small cuff buttons to large “dandy” buttons, which were often elaborately decorated and coated in gold gilt. Each were hand-sewn onto garments of all types, and as such, would come loose and fall off, only for me to find them centuries later. Here are some of the better buttons I’ve found while relic hunting in New Jersey. Small decorative coat button. It has a lovely flower/wreath design. Years in the ground has made the wreath design on this coat button barely visible. 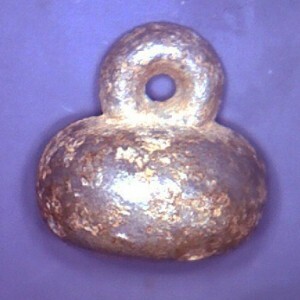 In the 18th century, Tombac buttons (made of pewter) were popular. These two were found in a small area along with a 1791 silver Spanish half reale. They’re a nice trio of finds from the 1700s. Most buttons from the 1800s had what is called a back mark (maker’s mark). Hours of online research have found no other examples of this exact button! I doubt it’s one of a kind, but I’ll call it that until I see another. After almost 200 years in the ground, this button sees light for the first time. 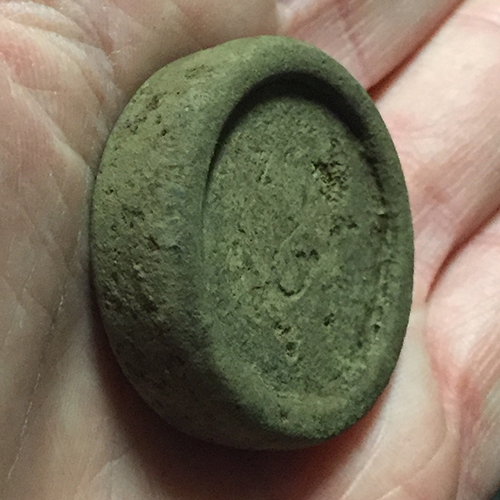 One of my most prized finds, this Dutch doublet style button dates back to the 1600s!!! 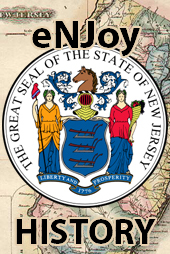 New Jersey is one of the few states that has a history that goes back that far. I am very lucky to have not just great property permissions to pursue my relic hunting passion, but amazing property owners who are advocates on my behalf. On one particular property that I frequent, the owners have told me of a trash pit/bottle dump that they excavated decades ago. While it was grueling work, it sparked in the same thirst for discovery that I have every time I go detecting. 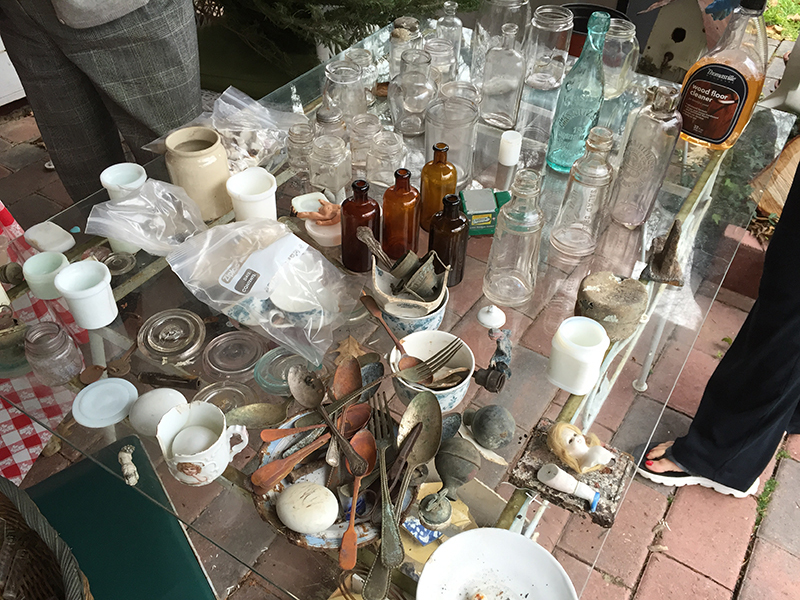 Bottles, tokens, clothing, toys – all were unearthed from this unintended time capsule. Remember – before we had the modern conveniences most of us take for granted, there was no such thing as garbage pick-up day, and certainly not recycling. So people did what they had to do – bury their trash in their yard! One Saturday not too long ago I got a call from the homeowner. She told me she and her husband unboxed all the bottles they dug up all those decades ago and asked if I wanted to see them (with the hopes of putting some into a local museum). Of course I did! When I arrived I saw them all displayed across a few tables. All clean. All wonderful. Upon inspecting the many glass artifacts, one in particular caught my interest: A&P EXTRACTS. 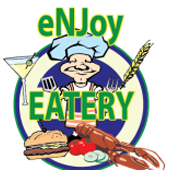 If you’ve lived your whole life in New Jersey, or even just within the past few years, chances are you have shopped for groceries at the A&P. It’s hard to imagine that those stores are now just a memory! The Great Atlantic & Pacific Tea Company was the nation’s first actual grocery chain (something nowadays we have a plethora of). It dates back to the 1850s, but was under another name at the time (Gillman & Co.). 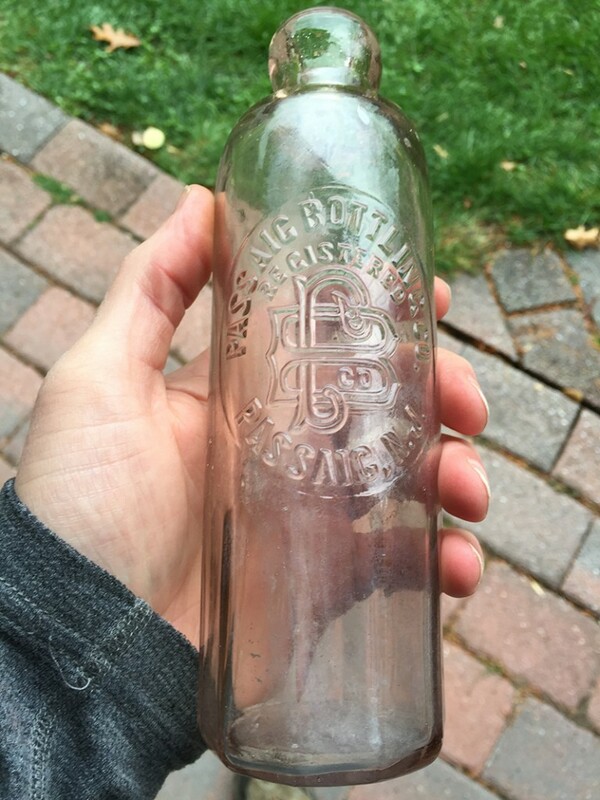 While I’m not much of a bottle digger, as it requires a special skill and different equipment, it amazes me how these items can come out of the ground so wonderfully preserved. Many did come out broken, or fragmented, but so many are in tact and a fantastic glimpse into the past. Quality is a key reason that these bottles have survived. Thick glass, embossed lettering – strong! 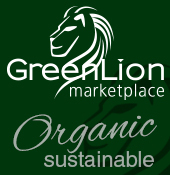 Not like the flimsy, environmentally-unfriendly plastic bottles that overflow our dumpsters and landfills. One of the thrills of relic hunting is the element of surprise. And as such, whenever you’re digging holes looking for hidden treasure, you never know what you may find. Digger beware! This month’s article will focus less on history and more on the eerier side of relic hunting. Since Halloween has just passed us (but actually was engulfing me while I wrote this) I think it’s a good opportunity to tell some stories about some of my creepier finds. I’ve gained permission to metal detect on a few different church grounds, with cemeteries either nearby or on the same property as the church. And don’t worry – this is not an article about grave digging! I do not, will not, nor do I condone relic hunting or disturbing in any way land that is a burial ground. But the surrounding areas? Sure! So long as I have permission from the land owners. A church in my hometown was built in 1793. 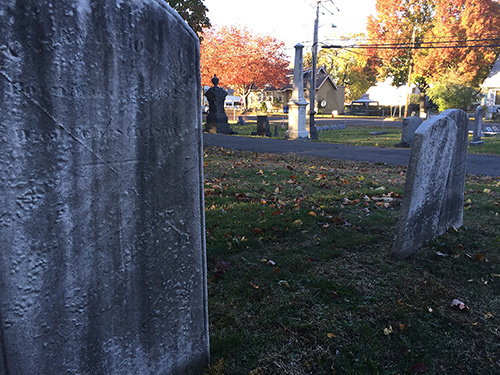 It has a cemetery on the grounds dating back to that era, and is still used for new burials. In fact, my grandparents are both buried in the cemetery. I was thrilled when I was granted permission to detect on the front lawn since it’s a very old church, and I was hoping to find some colonial- and Civil War-era artifacts. And I did! Up-close look at worn-away gravestones. The tombstones border two sides of the lawn, so while the property itself is beautiful, there was always an unsettling feeling as I searched for things lost long, long ago. Most times I was alone, and when behind the headphones of a metal detector, you don’t always hear what’s going on around you, which added to the uneasiness I sometimes felt. Chrome handle, lost from a coffin. It’s easy to get the heebie jeebies when walking around the cemetery itself (as I sometimes do when visiting my grandparents’ graves). Most of the tombstones are old! So old that some are worn so badly that you can’t read the names. Sadly, the original records from the church have been lost, so any weathered tombstones mark the final resting spot of an unknown person. 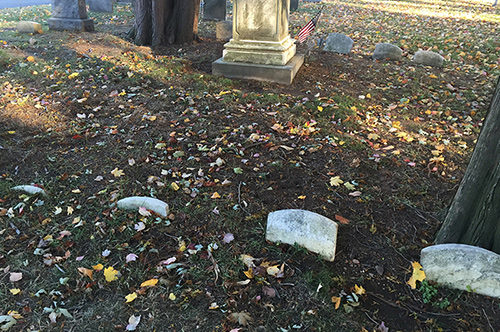 Some tombstones are in risk of being buried forever, but efforts are always made to save them. Grave markers slowly sinking away. The one farthest left is barely showing! One time while walking around, trying to soak up local history and appreciate my area’s forefathers, I had this strong feeling that I was being observed. No one was around me. It was very quiet. Suddenly I saw a face – in a very unlikely place! 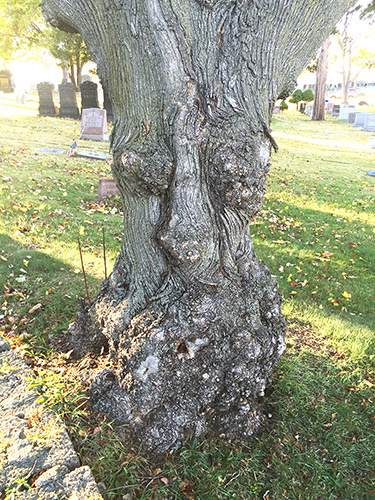 The tree behind me, who I now refer to as, The Old Man in the Tree, stood statuesque as he kept guard of the graveyard. Back to the lawn… Another item I found at this church really scared the group of young kids who were watching me intently. To them, it looked like a petrified monkey claw! 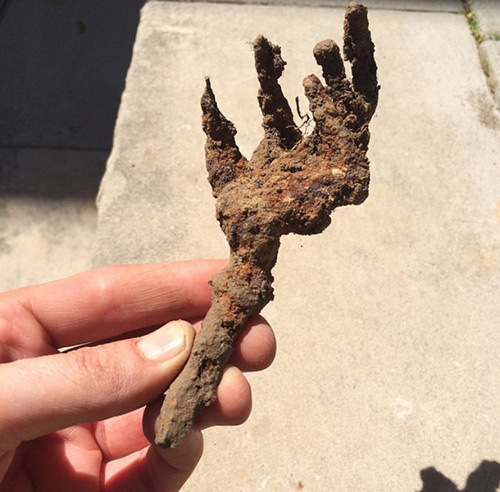 But in reality, it’s a hand-forged garden tool, probably dating back to the early- to mid-1800s. But it certainly looks like something that could be seen in a horror flick, and I can only imagine the scary music that could accompany the vision of it stalking a victim! The kids scattered away after they sawy it and didn’t come back for about a half hour. Petrified monkey’s claw? Or old hand-forged farm tool? When searching another church property in a different town, I was near near the rectory and found a silver colored crucifix. I had no idea what it was, but the priest and two nuns agreed that it was coffin adornment. What are the odds? Two churches, two remnants of a coffin! These aren’t exactly the types of things I like to find. Yes, just about everything I find belong to someone who is long gone, but I’m not comforted when finding part of their eternal resting space. 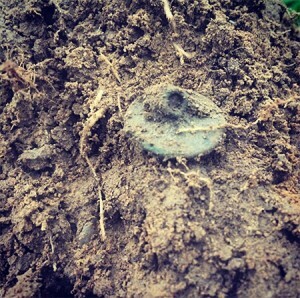 My most interesting story is about a button my friend James found when detecting a property that was built in 1802. 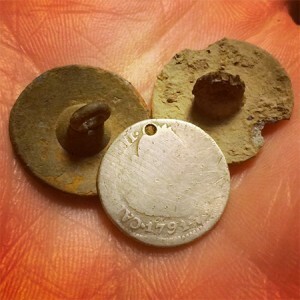 After a long day of metal detecting, he was cleaning his finds the next day and realized that he had found a Civil War general services button. I emailed the home owner because she had told me a relative of hers was in the Civil War, so I thought she’d be interested. She responded with a very interesting story! She told me that just that night, she woke up in the wee hours as something stirred. She saw a figure wearing a Civil War uniform. And just like that – vanished! Of course, something like that is pretty unsettling. James and I decided it seemed like this other-worldly visit was somehow connected to the button James found. So we returned it back to the homeowner believing that it’s meant to stay on the property. 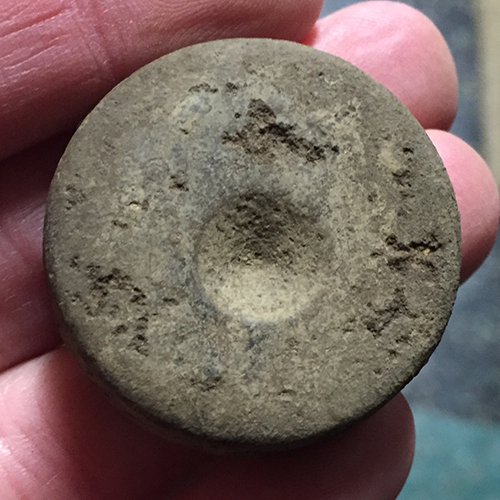 Civil War service button that inspired a ghostly visitor. 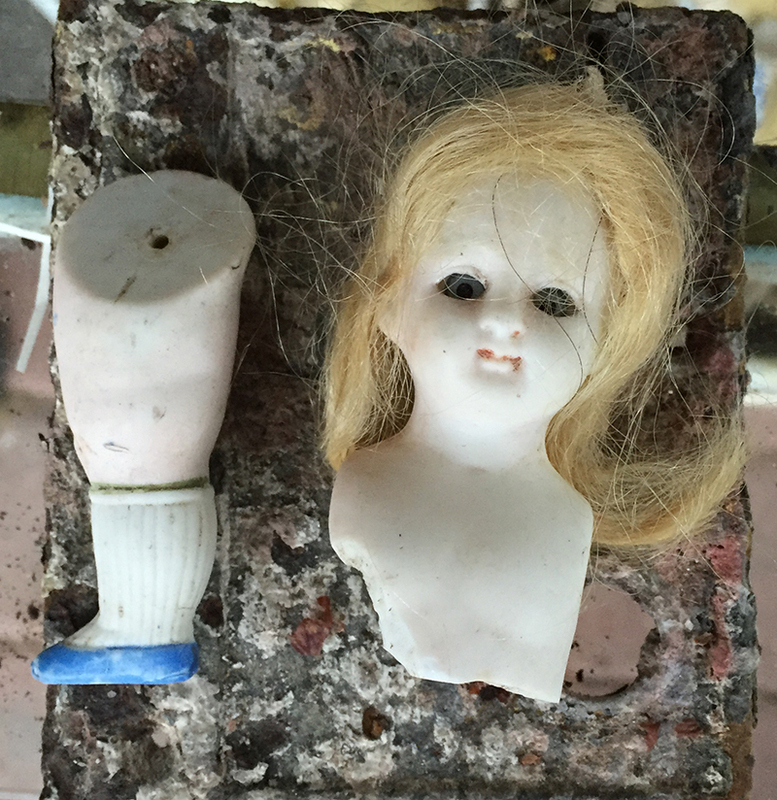 When relic hunting, on properties old or modern, you really never know what you’re going to unearth. But whatever we find, it once belonged to someone. We appreciate that and value all relics found, whether they’re worth actual money or not. To us, these items are treasures, and we’re happy to save them from their burial grounds so they can be preserved and inspire others to learn about history.